The Bucket Elevator has been engineered to provide optimal efficiency. Noise, turbulence and materials damage are reduced to lowest possible levels through specialized design and construction. Heavy-duty construction ensures a long life, and competitive pricing offers cost efficiency. The Bucket Elevator maximizes material handling efficiency with smooth, even fill, minimal material build- up, a generous clearance between trunking and cup for quiet operation, superior pulley design, and easy-access features that simplify maintenance. All Gerber Bucket Elevator systems are designed and built to exacting specifications— giving you a system that will give you more years of service, with less down- time and repair. The Bucket Elevator uses buckets that are water- level tested to gauge their real world fill capacities, not estimated capacities. Bucket spacing is optimized for maxi- mum throughput on your bucket elevator. Our engineers revieweach system we build to ensure compatibility with your specific setup. Standard bucket is Maxi- Lift with other brands available upon request. Additional cup styles are also available upon request. 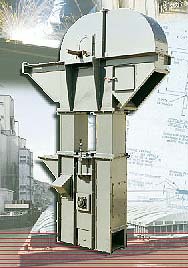 This means that you will be able to meet or, in most cases, exceed your expected capacity with a Gerber Bucket Elevator. Rapat Corporation, Hawley Industrial Park, 919 O'Donnell Street, Hawley, MN 56549. Tel: 218-483-3344; Fax: 218-483-3535.